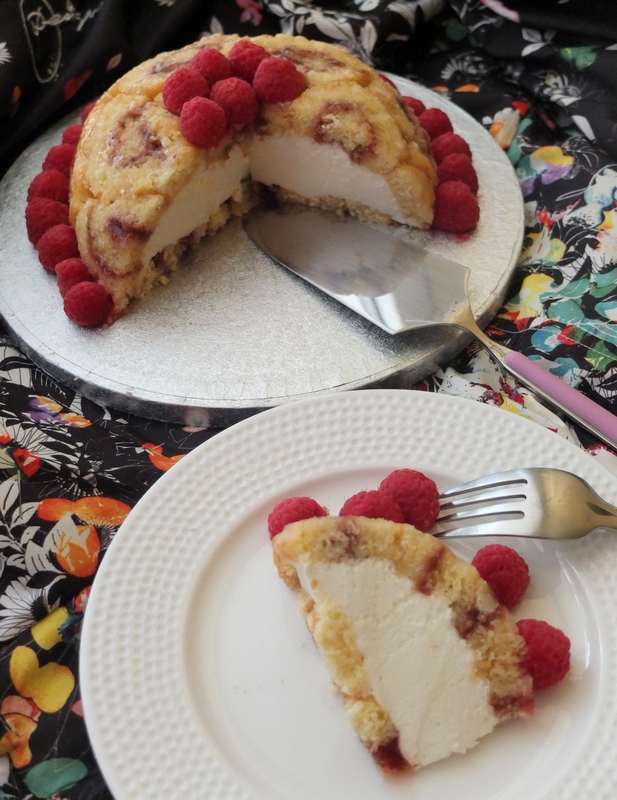 Lemon mousse and raspberry charlotte royale recipe – and the cakometre! 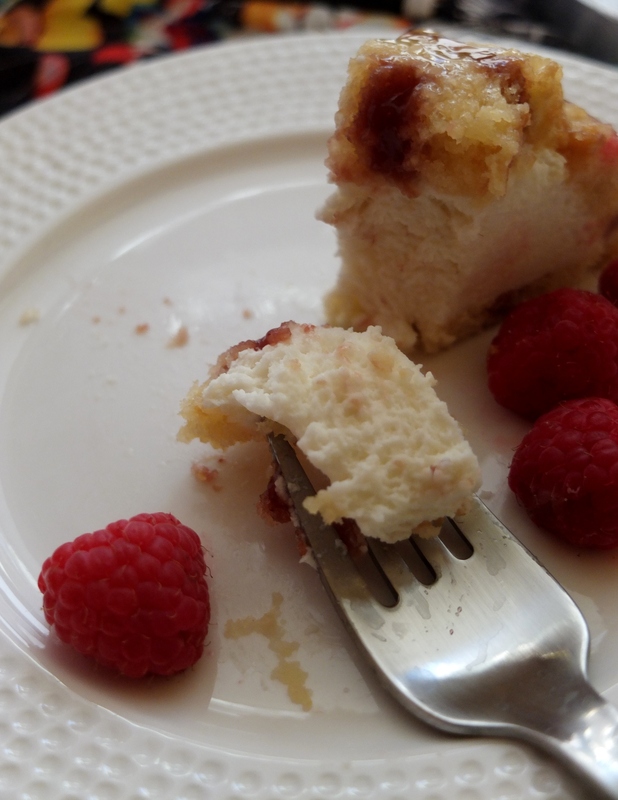 Unfortunately a Charlotte Royale is not the kind of cake you can take hiking with you. Not only would it be muttering ‘What am I doing here in the countryside with these peasants?’ It would also get battered and fall apart in the sun. A bit like me. Sunday I spent the day struggling up the hills of Collserola on the outskirts of Barcelona whimpering ‘I’m not a really a hiker! Climbing’s easier’ and ‘I’m dying!’ I’m fine sitting at the bottom of a rock then climbing up a vertical face. But I don’t really enjoy plodding up a looooong slope with no end in sight, observing the backs of proper hikers striding effortlessly upwards, clearly not suffering like me. In the end it was so hot in the hills that even hardened hikers were wilting. Hurray! I mean oh dear… The group voted not to continue up to the peak, we sat down to a picnic and I survived the day, went home and had my two slices of cake. 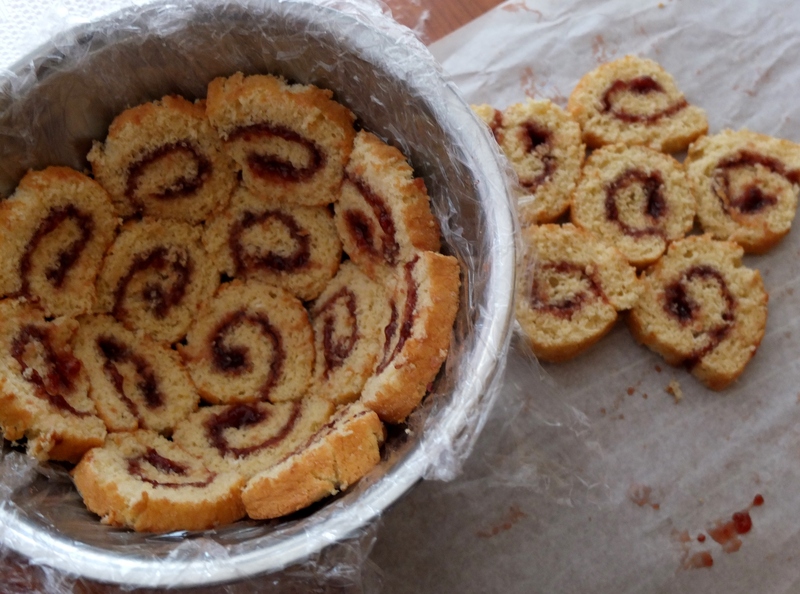 Prepare your swiss roll baking tray (mine’s approximately 19cm x 28cm x 3cm): butter lightly then line with greaseproof baking paper. 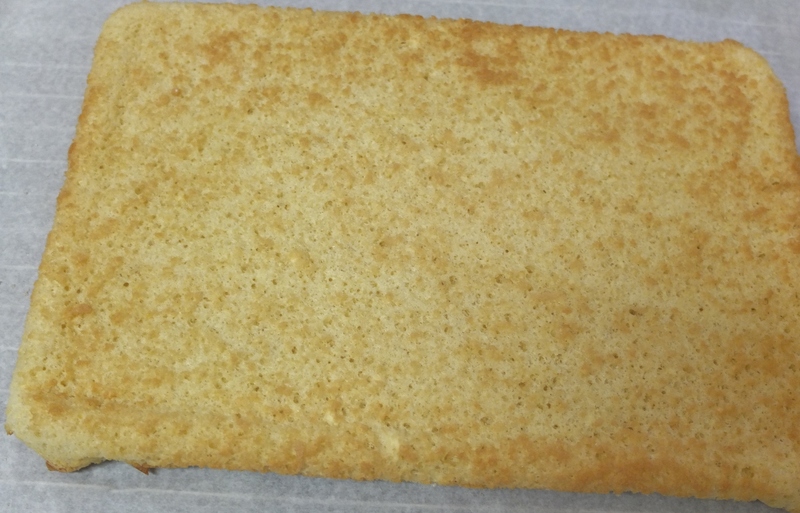 Make the genoise – the recipe’s on my ‘basics’ page: genoise sponge. 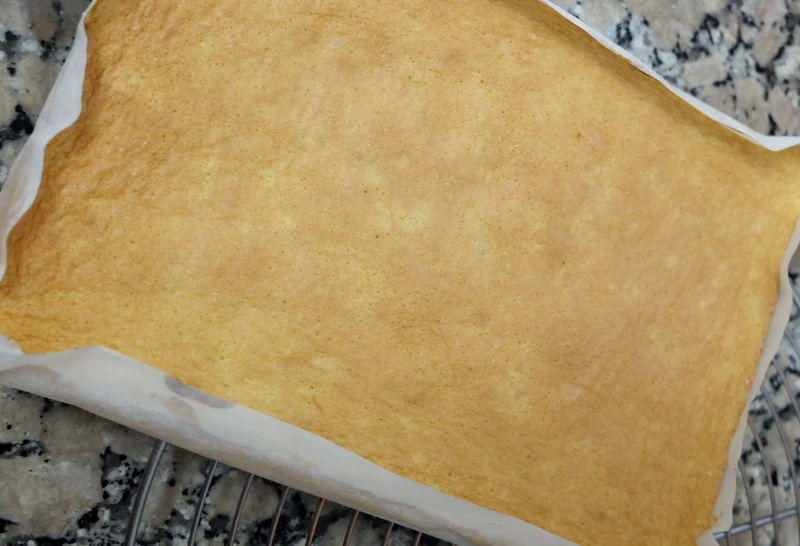 Pour the genoise batter gently into your tray and spread evenly with the back of a metal spoon or spatula. Bake 10 – 15 minutes until golden, a skewer inserted in the middle comes out clean and the top springs back slightly when pressed lightly with a finger. Don’t open the oven door for the first 10 minutes! Once out of the oven leave to cool a few minutes. 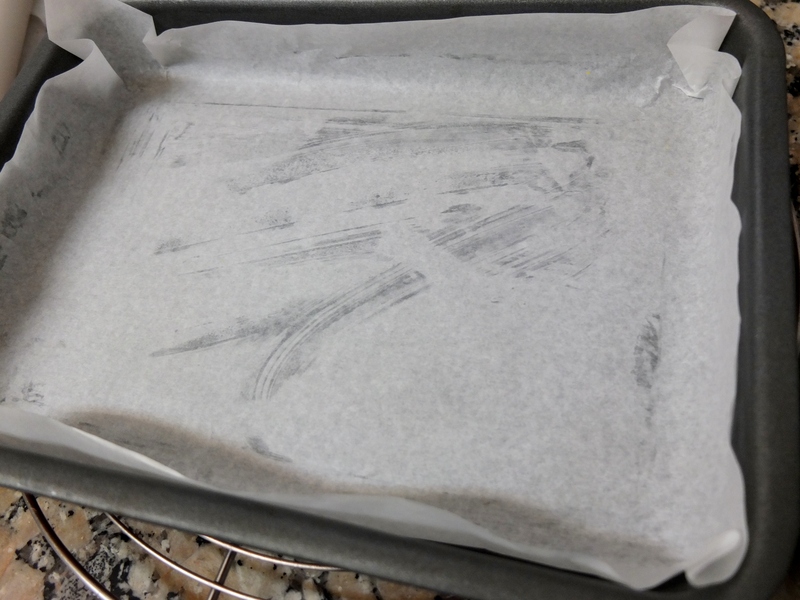 Place a sheet of greaseproof paper over a wire rack and sprinkle with a little caster sugar. 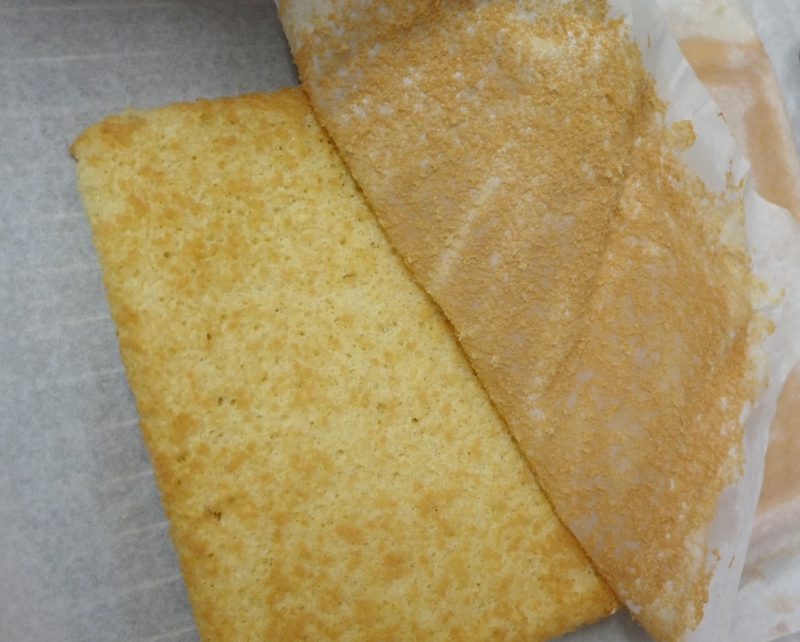 Turn the genoise on to the paper and peel the paper on the top off the sponge. 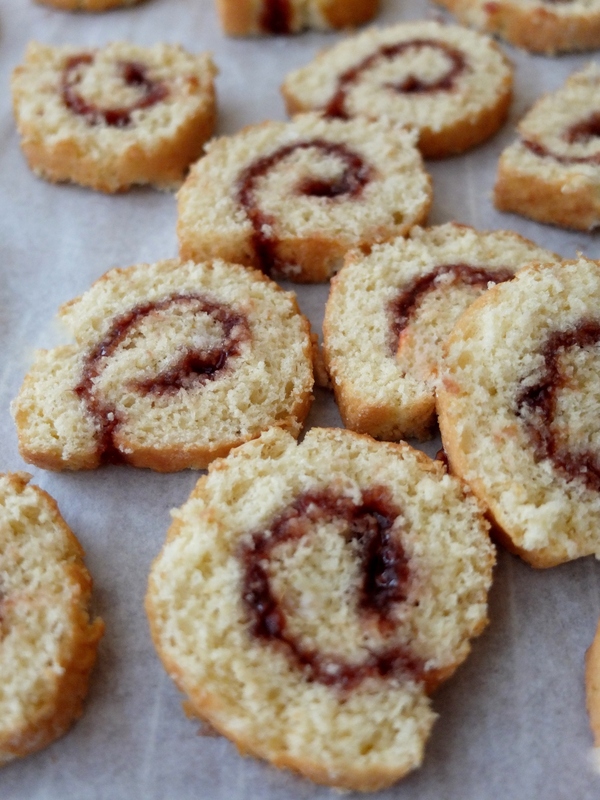 If you’re not making the swiss rolls immediately, cover with a lightly damp and clean teacloth. 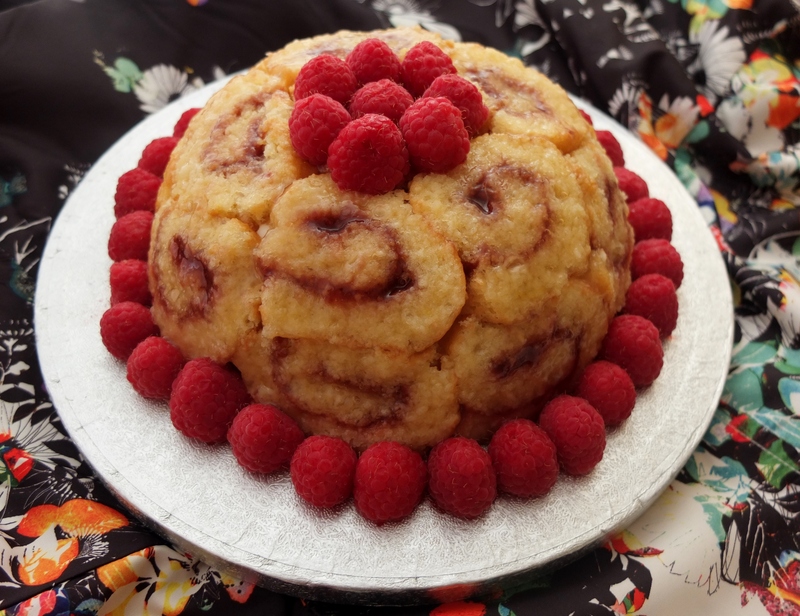 Spread a thin layer of raspberry jam on the sponge – about 5 to 6 tablespoons, to taste. 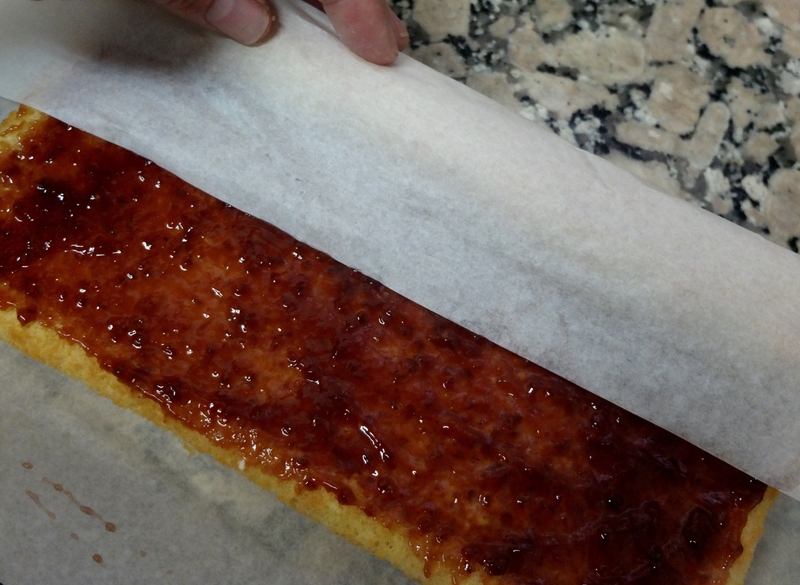 Carefully roll the long side towards you, a little tightly but ensuring the jam doesn’t squish out. 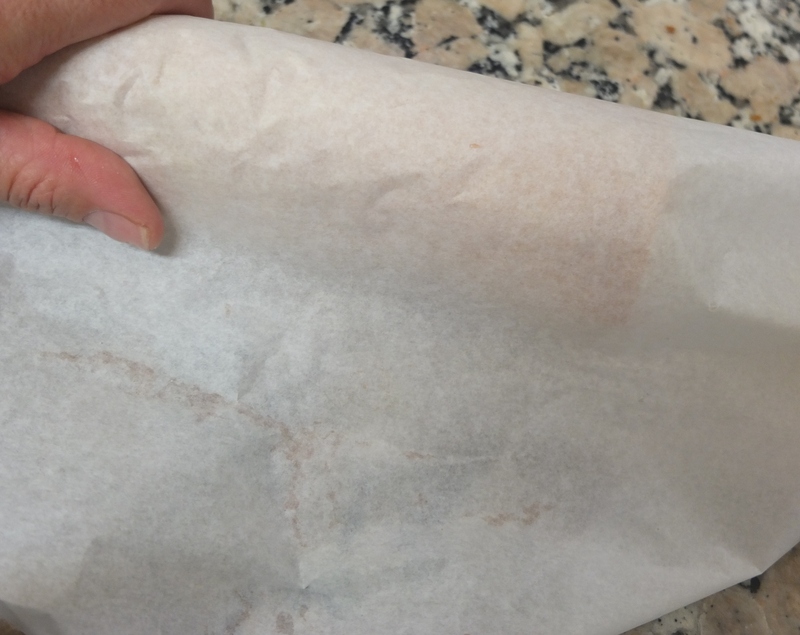 Use the paper to help you. 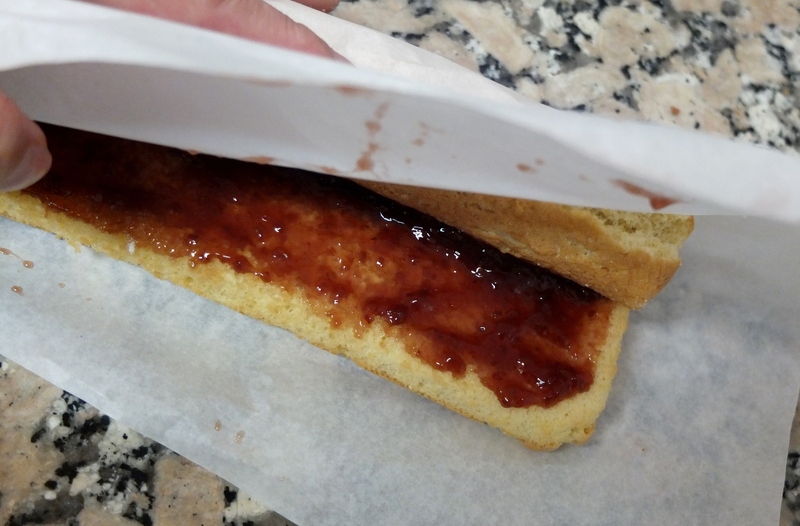 Press down lightly on the swiss roll with the seam underneath, to help seal. 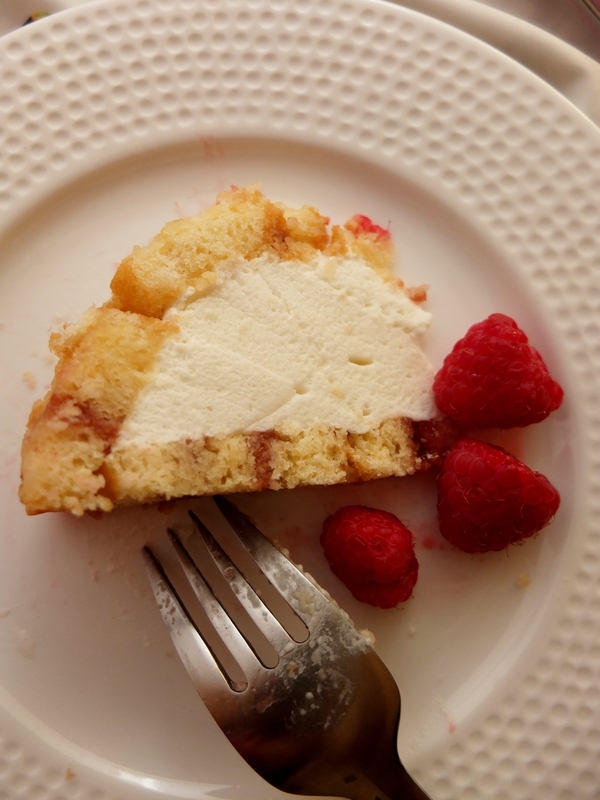 Cut with a long serrated bread knife into a) 20 thin slices to include a sponge base or b) 14 thicker slices for a cake without a sponge base. 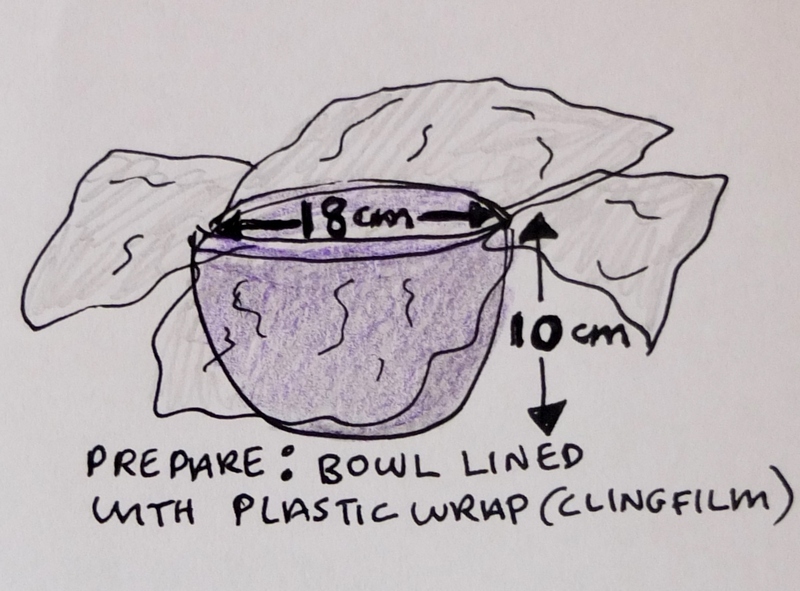 Place 14 slices in the bowl (reserve six slices for later use if making a base). 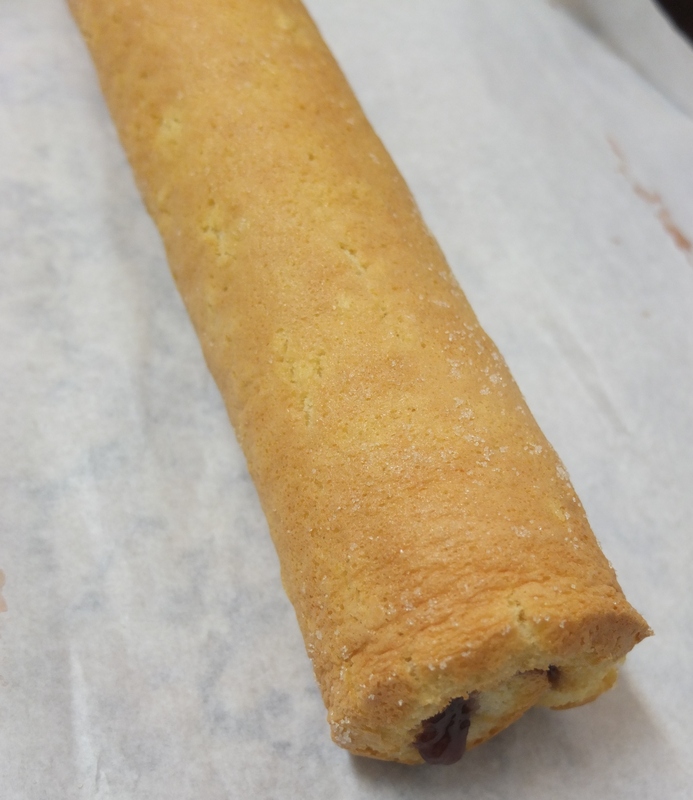 This is the prototype with 14 slices of swiss roll and no sponge base. You might prefer this version. 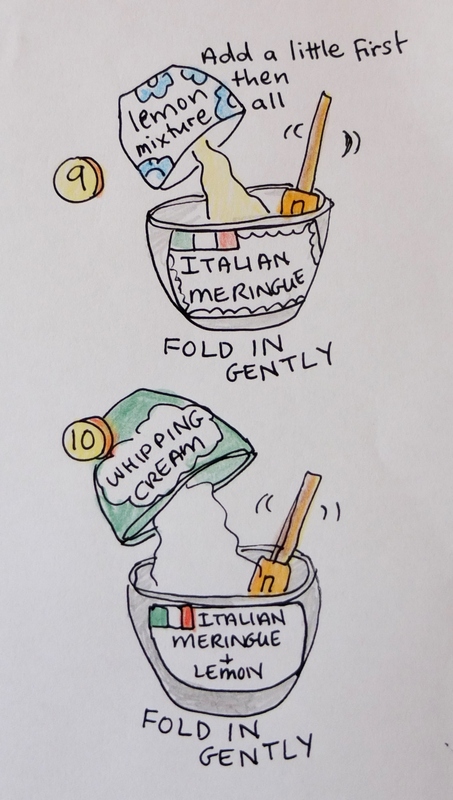 Please go to my Italian Meringue page under the basics section if you’d like extra tips and photos. 1. 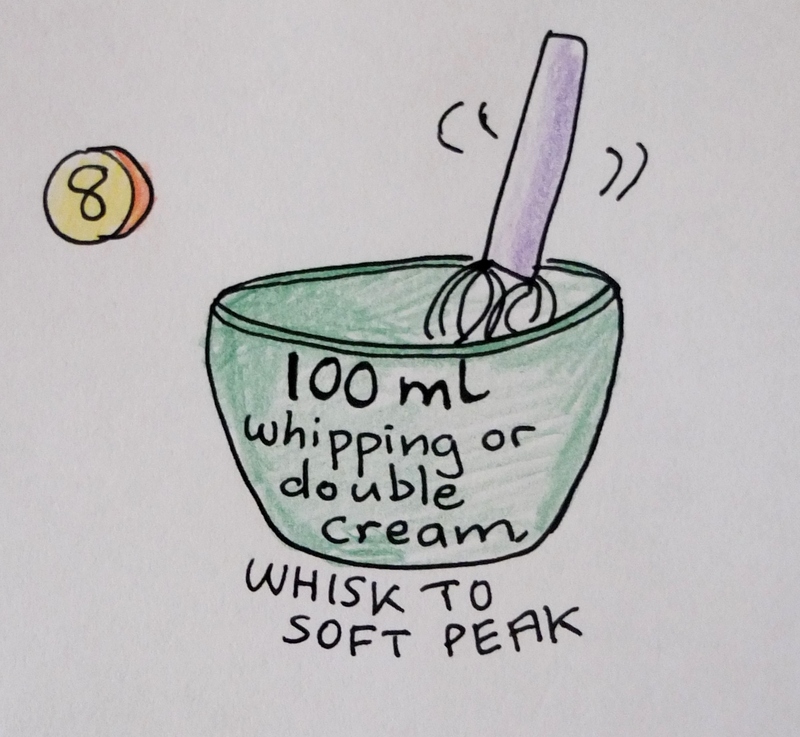 Pour the lemon mousse carefully into the bowl lined with swiss roll slices. 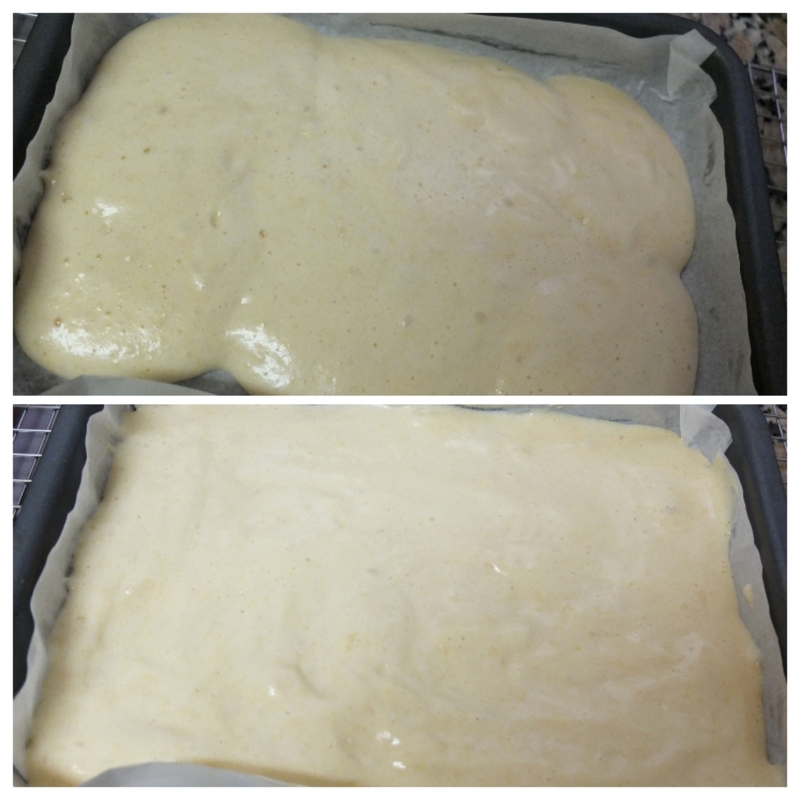 Freeze 15 minutes. 2. 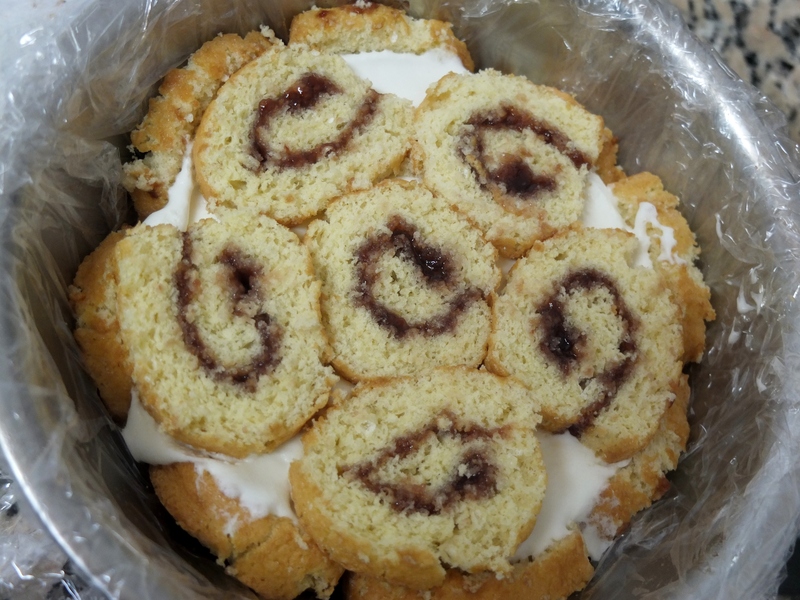 Take out of the freezer and cover with the reserved swiss roll slices. 3. 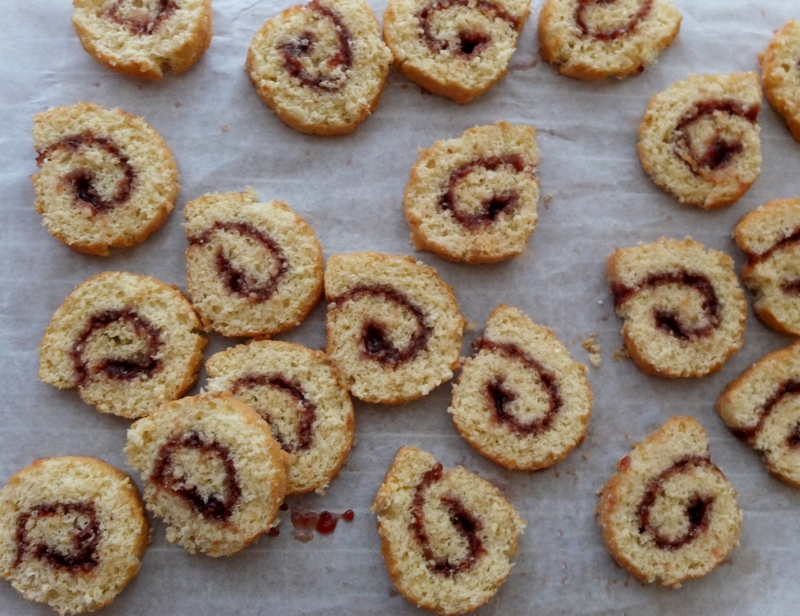 Brush the six swiss roll slices on ‘top’ with freshly-squeezed orange juice. 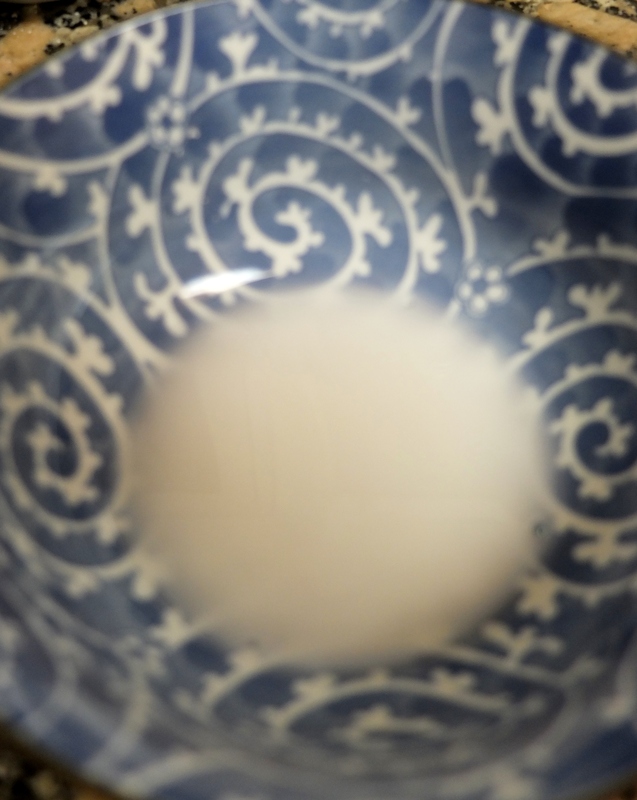 Leave to soak 5 minutes then unmould onto a serving plate. 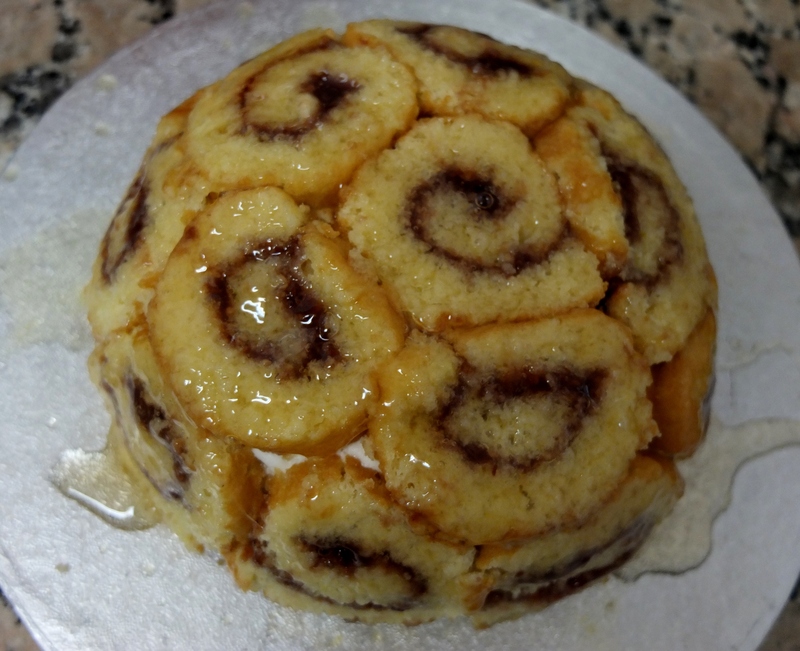 Brush the other swiss rolls on the charlotte with the remaining orange juice. Freeze for an hour or more so it can set. 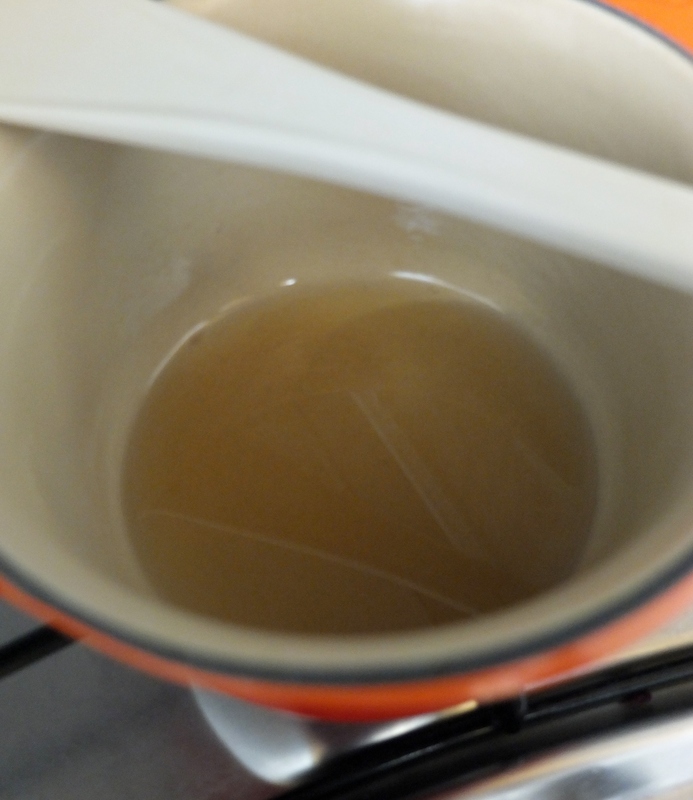 Dissolve the caster sugar in the water at a low-medium heat then bring to a boil, stirring to make a light syrup. 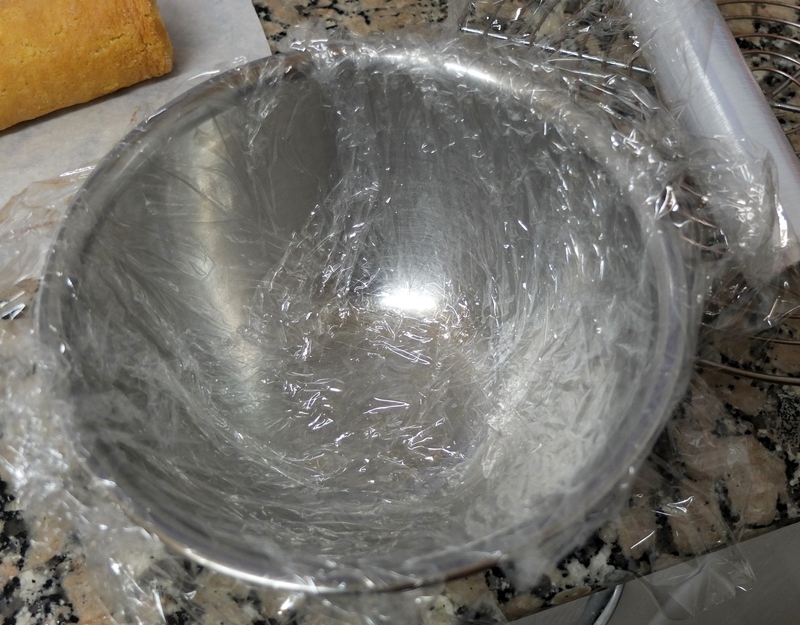 Mix the arrowroot with 2 tablespoons of water, stirring to make a smooth white liquid. 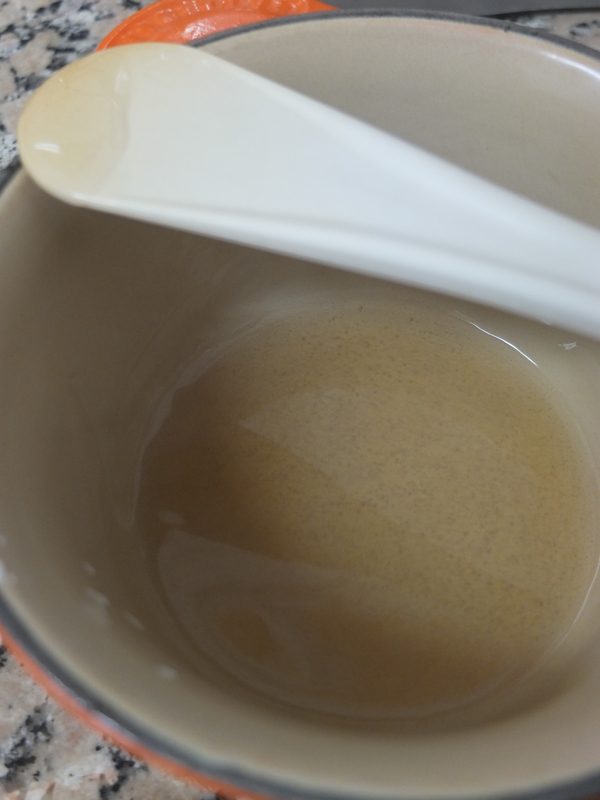 Stir this mixture into the syrup, return to the heat and stir constantly till it boils again, then immediately take off the heat. 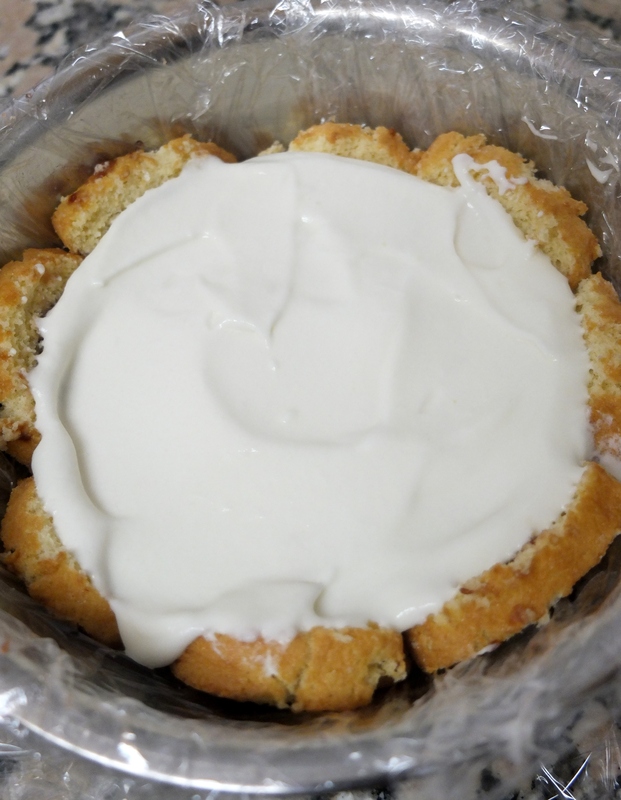 It will have thickened to a soft jelly-like gloopy consistency. 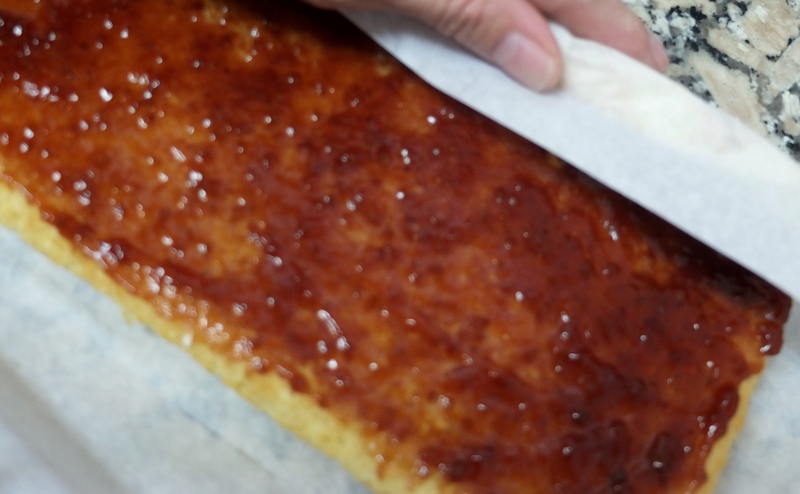 Let the glaze cool slightly before spooning over the charlotte (or brushing) to have a thinly even and shiny layer. You could eat the charlotte after a few hours, but it’s great the next day! 🙂 It keeps well in airtight tupperware for around 3 days in the fridge and a few weeks in the freezer. 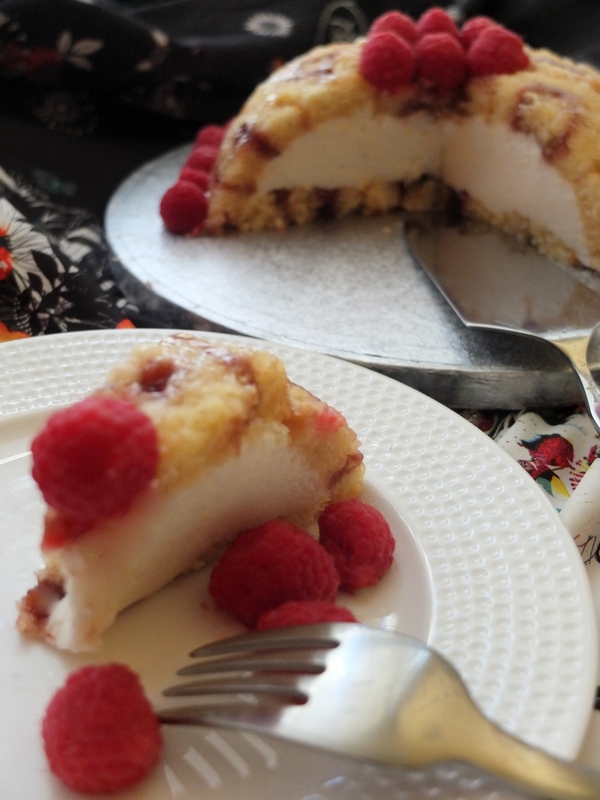 Do try making this lovely Lemon mousse and raspberry charlotte royale – it’s actually pretty straightforward! 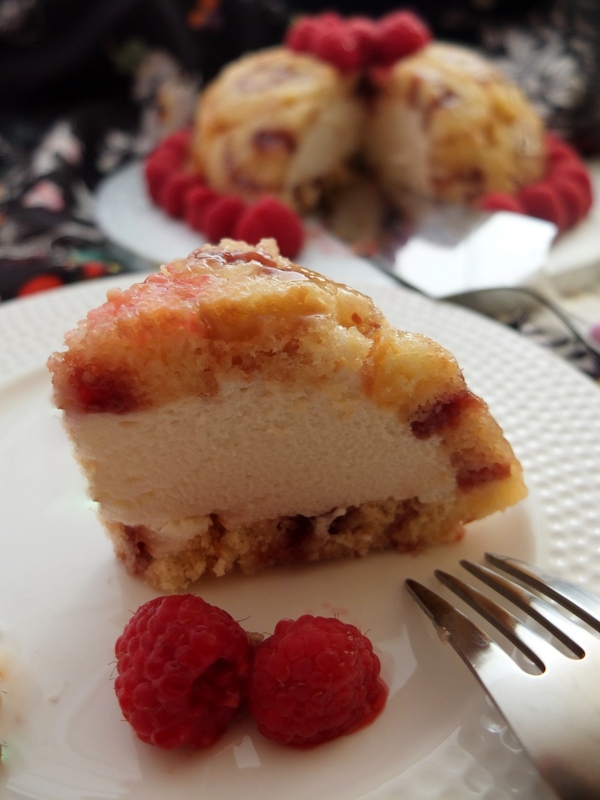 You get to practise making a genoise sponge and classic French mousse made with Italian meringue (is that a contradiction?!). Anyway, it’s all worthwhile because it’s so fairy-tale-like delicious! 3 hours later – Have just found out about the royal baby Charlotte who was born yesterday?! Total cake serendipidity!!! What an extraordinary cake! 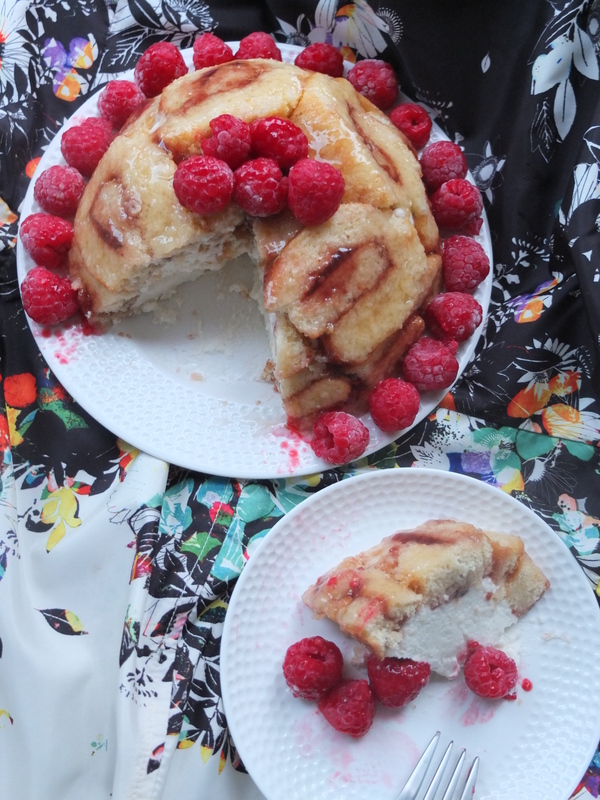 It would be very difficult to limit myself to one slice! The cake looks delicious! Will be pinning it to try it sometime…and it’s so cool you’re near Barcelona! I was there last July and absolutely adored it!! I’d certainly like a virtual slice please, it looks so pretty and sounds great ingredients-wise too. 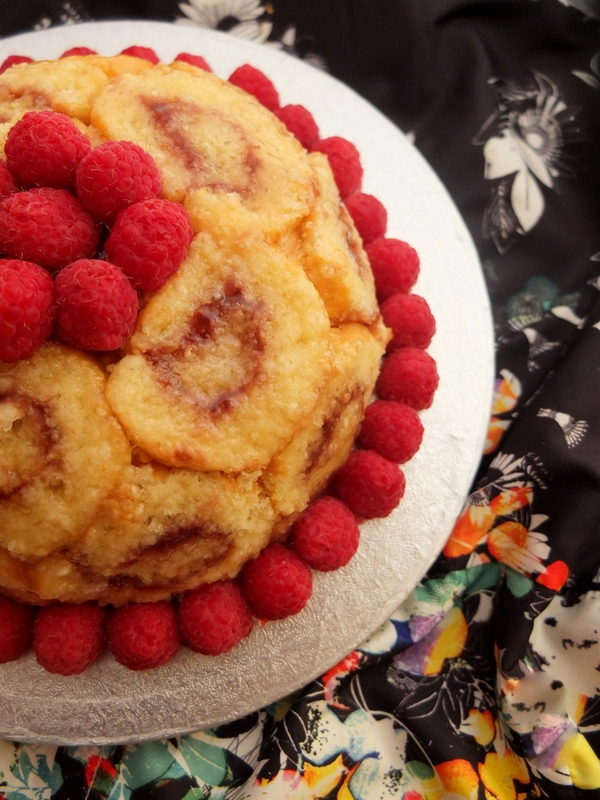 I do love lemon and the jam roll looks lovely as well. I used to not like them when I was younger, but then I just realized I was fussy and only liked homemade ones 🙂 So if I can get into making them this should be on the list! Thanks for sharing with Fiesta Friday. 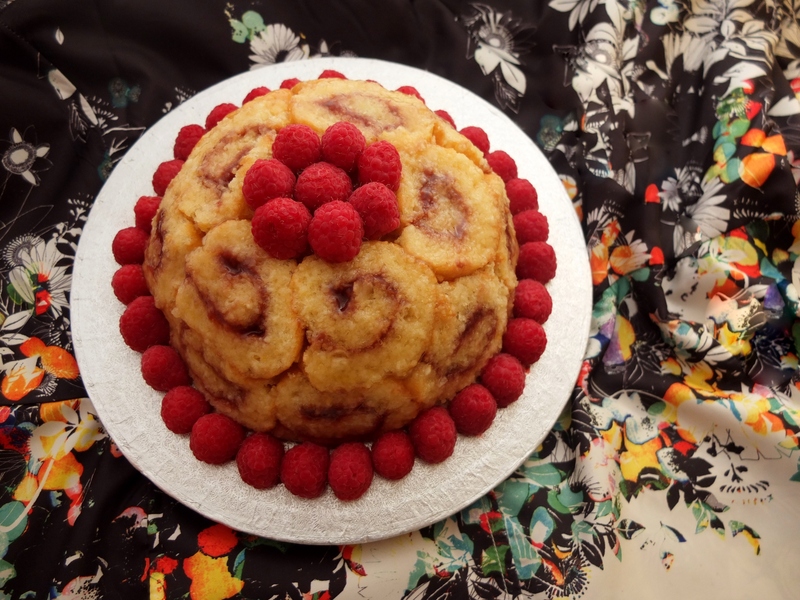 You are right… that’s a very impressive cake! I’m used to make charlotte… but with savoiardi cookies…. 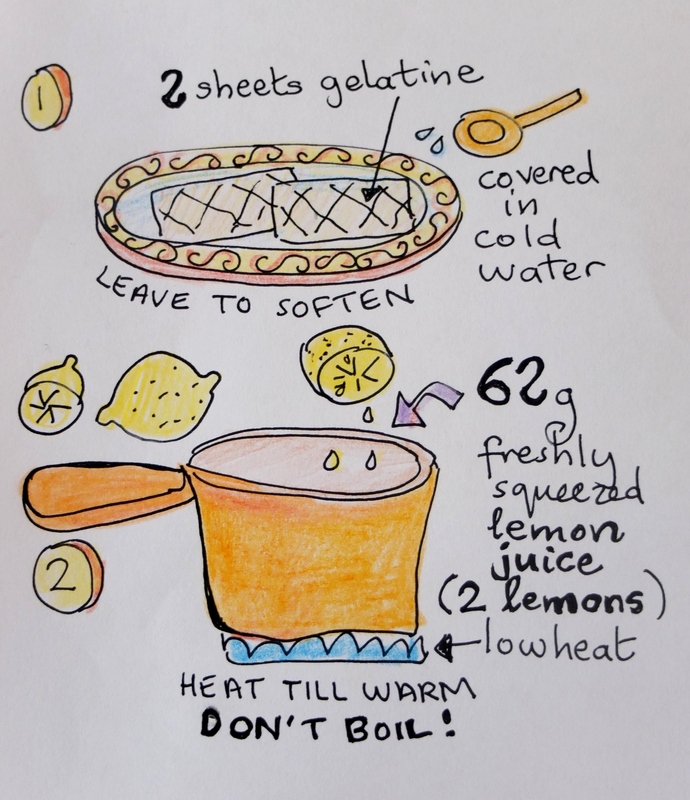 your recipe goes beyond! This cake seems just came out of a pastry shop!